We're releasing the product today or it's Willy the Mail Boy's head on a silver platter. So I'm doing some final testing on a foreign OS so that we can be sure it works. It's odd navigating around in French Windows (Bah Dum Psh!) and to actually already know what I'm doing. Text? Who needs stinkin' text. I navigate by muscle memory of where that item was in the list the last eighty times I clicked on it. But that's not what I came here to talk about. I came here to talk about a French keyboard layout. First of all, 2 in French is apparently é. Second, if you want to try typing my username ("martys") on a French keyboard, go ahead. You'll end up with ",qrtys". But my favorite is the French throwback to the old "Interactive Fiction" text adventures of yore when trying to enter the default workgroup. Because when I typed in Workgroup, it came out zorkgroup. You can get some pretty amusing stuff if you're not paying attention. Intimate knowledge of the InstallShield environment that could only be gained from working on a project from Frankenstein himself. What, you think you get paid for this kind of thing? I'll tell you one thing, when I first signed up for an internship, I told them I knew C# and VB, and not a thing about InstallShield, and now that's all I do. Funny, that. So, you think you know a thing or two about computers? I'm a level 8 warlock. What level are you? The basic spells are launching standard user-level apps, and using them in the simplest way. The first level of the arcane are menu items in programs. Level two are keyboard shortcuts. Level three are command line programs. Level four is learning to hook command line programs together. Level five is regular expressions and other concentrated ASPs. Level six is batch files and other simple scripting/macro languages. Level seven spells are basic computer programs, be it C Java or ASM. Level eight spells are advanced algorithmics and techniques. Level nine spells are entire operating systems, compilers and other powerful grimiors. For my own edification (hehe... EDification) I wrote an HTTP server between yesterday and today in my spare time (5:30 PM onward). The coolest thing was when I navigated to a web page at my local ip address and saw it come up, with external stylesheets and graphics and everything! Ah, fun times. Of course, it will need some refinement. I'll worry about that later. The hard part is done (that is, figuring out how servers and clients communicate). Now I can implement PHP and MySQL an stuff. Programming (these days) is object based. If I want to, for example, play a game, I would be a main character. This character would be an object that could perform actions in an environment (another object). For example, I could say MainCharacter.MoveForward() which would call the MoveForward method of the MainCharacter object. The MainCharacter object has a handy reference to its environment so that before it updates its position, it looks to make sure that the environment will allow it to move forward, by calling, for example, Environment.IsFree(MyPosition + 1), which will let the MainCharacter object know if the position directly in front of it is open. Which a careless programmer might try if he wasn't thinking straight or just slipped up. Now, if you tried to call a method of one class (Map) on an object of another class (Sprite), and the compiler let you actually do it, you would have the machine code looking through a Sprite object layout for data in a map object layout, which just gets all kinds of messy, not to mention memory leaks, data corruption, and computer crashing. So it's a good thing the compiler is there for us. At least, it's there for us normally (i.e. when we're using early binding). Late Binding basically says, "Screw you, compiler. You think you're so smart, with your strongly-typed classes, and your optimized code? Yeah, well, screw you! I'm gonna make a sprite a map anyway and there's nothing you can do about it!" So, yeah, there's a couple of things to point out. Obviously they don't make it easy to screw the compiler over (not made hard just to make it hard, but because late binding requires more detail in the code because it can't get it inherently by the types). Also, the .NET Framework is still pretty adamant about correct types being used, so this would fail in .NET, but if it could be run unmanaged (as in older languages, i.e. C/C++), it would run along on its merry way, doing the very thing that the compiler stopped us from doing up above. We're creating only a basic Object instead of a specific type of object, so that we can call anything we want to on it. Fun, huh? 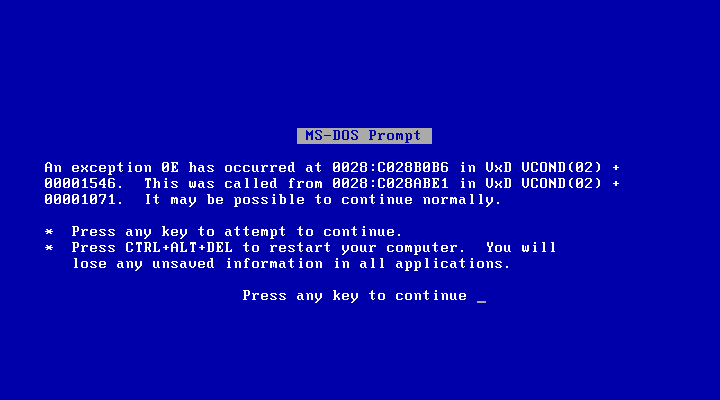 Start screwing around in your memory for long, though, and you'll suddenly find a BSoD, or maybe a GSoD if you screw up in the right spot. Which would actually be pretty amusing. And awesome. And incredibly unlikely. And nearly/entirely impossible, based on your current OS memory access settings. But still.